How to Build a 3-String Cigar Box Guitar - This new 8-page set of plans walks you through building a simple but fully playable 3-string cigar box guitar from scratch. These present well-illustrated, up-to-date how-to info in an easy to understand method that will enable young and old to build their first cigar box guitar with minimal effort. If you want something more challenging, then dive head-first into our vast selection of instrument plans! You will probably have some questions along the way. That's what makes Cigar Box Nation so great! We have forums, discussions and even a live chat room on the front page just waiting for your questions. We have lessons in Video, TAB and other formats for every level of player. You can see them all here. Where do I get the parts needed to make a cigar box guitar? 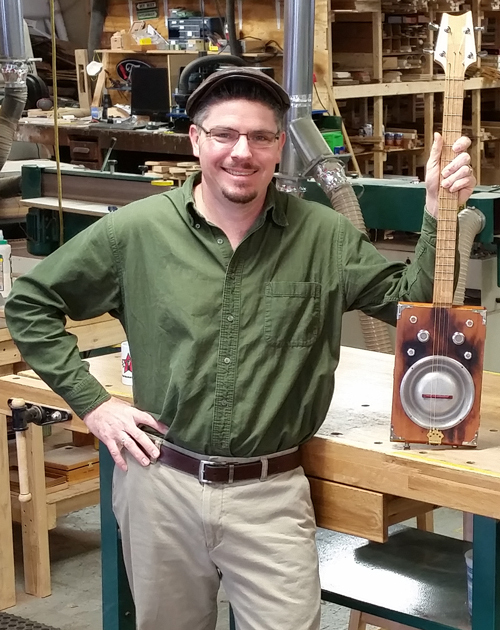 Cigar Box Nation is run by C. B. Gitty, the cigar box guitar superstore. We have kits, parts and great building ideas just waiting for you. Visit us at www.CBGitty.com. Now that you have the basics, I encourage you to create your own Cigar Box Nation profile and really dig in to all the conversations and photos. Thank you for visiting Cigar Box Nation. P. S. If you want to know more about this whole Cigar Box Guitar movement, check out the Cigar Box Guitar Manifesto. Im planning a build. What if I do not center my neck on the CB, but instead I want to position it very off-center. Are there building rules or guidelines for a good sounding instrument, as far as neck location? I Love the CBG. i added two cbg songs I recorded to my page and some pre cbg songs. If yu havethe time give them a listen. As Pick said Tassie oak you can get it at Bunnings in 25 mm thick 75 mm wide 1.2 m long around $22 odd you can get 2 necks from that width I try to get mine with some recurve in it to help with neck tension when it’s strung up ready to play , have fun Cobba . David , Tasmanian Oak seems popular for Australian necks . Hi everyone i am new to the cbn , thanks for adding me! now i have a new addiction,building CBG'S!! Enjoy my pics! Hey guys! Thanks for the Add! I have been playing guitar for over 40 years. I will start my first CBG build tomorrow! Really interested in learning about fretting necks and fret boards. Again, thanks!! I have a question about mounting a piezo pickup. Everyone seems to use a hot glue gun , but I don't have one. Is there any alternative? Can I use wood or super glue? hello guys. New member. building 2nd CBG.. posted in "introduce yourself" section already.. still trying to navigate and learn this forum. Here's tone on 1st CBG build. I am HOOKED. found this box for build #2..
Good morning, just want to hi from Australia. Became interested in CBG after my son got one from the local store. Learning to play Proud Mary,.